Keira Naughton plays The Goatwoman of Corvis County. All photos by Kevin Sprague. Keira Naughton as Charlotte assures her son played by David Rosenblatt that her newest husband did not mean to break his leg. Charlotte and Randy enter into negotiations. 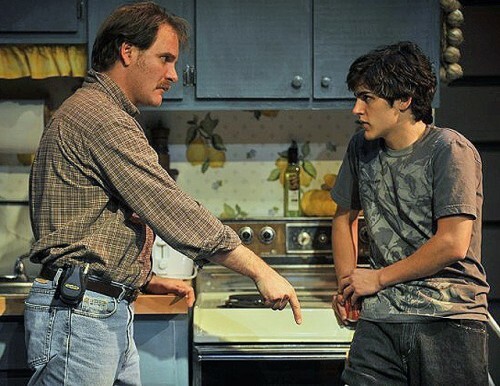 Randy (played by Tomas Kee) uses threats to control his stepson David (played by David Rosenblatt). 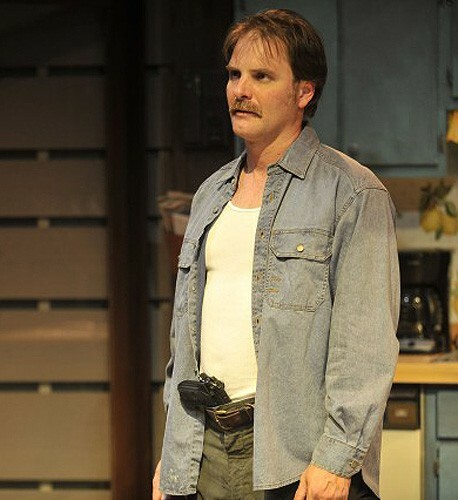 Randy’s gun on the table assures a one-sided discussion with the lawyer played by Daniel Berger-Jones. The wife is shut out of negotiations about her future. When unable to get his way, this Alpha male packs some heat. Problem solved. Alls well that ends well. Or maybe not. Tune in again tomorrow. Keira Naughton as Charlotte Clark. The Goatwoman of Corvis County by Christine Whitley. Directed by Robert Walsh. With Keira Naughton as Charlotte, Thomas Kee as Randy, David Rosenblatt as David and Daniel Nerger-Jones as John. Set Designer, Susan Zeeman Rogers, Lighting Designer, Matthew Miller, Costume Designer, Govane Lohbauer, Sound Designer/Resident Music Director, Bill Barclay, Dialect Coach, Judith Jablonka, Assistant Costume Designer, Shelby Rodger, Stage Magaer, April Carmack, Assistant Stage Manager, Kai Ray, Run Crew (Sound) Michael Pfeiffer, Wardrobe, Jessica Ziemeck, House Management, Hal Smyth, Greg Hughes. One Intermission. running Time: About 2.5 hours. At Shakespeare & Company's Elayne P. Bernstein Theatre, 70 Kemble Street, Lenox, MA. Runs until August 31. "They say you should never open a new theatre with a new play or a new playwright," Tina Packer chortled to an expectant audience in Lenox last night, "but tonight we break all the rules." Indeed they did. For a company with more nerve and determination than a platoon of veteran soldiers, they charged into the fray of transforming an old, recalcitrant building into a performing arts center. There are still many skirmishes to be fought, but clearly the first and most important battle is won. They have created a wonderful state of the art theatre for all of us in the Berkshires to enjoy out of the former athletic center for a Boy's School. The $10 million dollar renovation continues. First a few words about the theatre, then on to the impressive play that had its world premiere last night. Looking up from any seat in the intimate space, which holds perhaps 180 people, you can not help but be impressed by the grid of theatrical lighting with more than a hundred instruments, enough to outfit a Broadway show. The lighting and sound people are perched above and to the left side of the audience, behind glass where they are unobtrusive, yet in total control of the complicated proceedings. The new risers, missing at the facility's shakedown performance of Shirley Valentine last month, surrounded the stage area on three sides giving everyone a superb view of the playing space. The seats and risers are flexible and can be rearranged into a traditional theatre configuration, or perhaps even into a sort of theatre-in-the-round shape, though in the rectangular space, it would likely be an oval. The theatre is dedicated to Elayne P. Bernstein, a long time friend and supporter of the company. She was there of course, as were Jerry and Honie Berko who underwrote the first production, The Goatwoman of Corvis County. You could say the whole Shakespeare & Company family was there, too. I noticed Elizabeth Aspenlieder from The Ladies Man, as well as Michael Hammond and LeRoy McClain - who are currently playing Iago and Cassio in Othello - all enjoying a night off after their afternoon performances. But everyone's attention was focused on the four performers in Goatwoman, all in their first season with the company, and the verdict is in. The new play by novice playwright Christine Whitley was the debut of a major new talent, one whose inaugural work broke new ground. Her play about a disaster of a family merged the three worlds of theatre, cinema and tv soap opera into a compelling story of a dysfunctional family that is truly riveting, in the way automobile accidents are. Why plays like this attract our rapt attention can only be explained as a guilty pleasure. They make our lives look normal in comparison. 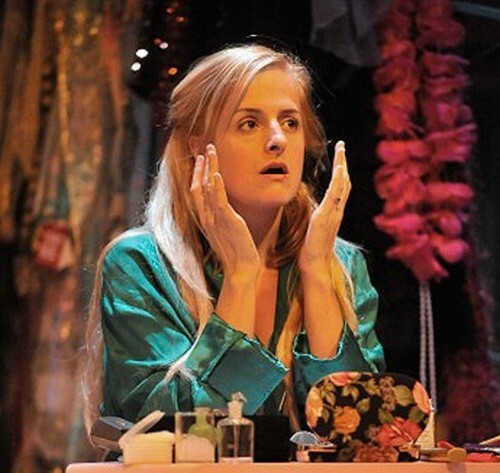 Keira Naughton is brilliant in her portrayal of Charlotte Clark who quite simply has no redeeming qualities in this play, she is a bleached blond bimbo who believes that "one should always look their best." Her husband Randy is equally repulsive, and a true jerk. As drawn by the playwright, one develops an instant loathing for these two, which only deepens as the evening progresses. Dramas about dysfuctional families work best when you either detest the characters or have pity for them. Here we feel a little of each. In one scene, after her husband Randy deliberately breaks her son's leg, she retires to her room to change her clothes and put on makeup, taking an hour to get ready before they take the bleeding lad to the hospital. Charlotte is no Stella or Balnche with echoes of Tennessee Williams, even if the action is set somewhere in the south. Here abuse of spouses is a two way street. In the hands of Naughton, she is a very disturbed, eternally conniving and a perpetual user of men. Randy is her fourth or fifth husband, and her son David is a leftover from an earlier terminally failed one, and is largely treated as such. He is quickly learning to manipulate as a survival technique, though he is hardly a match for his mother or stepfather. Delivering a powerful performance as the alternately raging and whining Randy is Thomas Kee. He conveys the shallow ethics and raging hormones of a demanding Alpha male who goes all wobbly at the sight of Charlotte's hair done up just as he likes it. "It makes you look like Angie Dickinson," is his ultimate compliment. At those moments he can be putty in her conniving hands. Through a series of brilliant flashbacks we see their courtship evolve, the promises made, then back in real time, we see these same enticements broken. David Rosenblatt as the son tries to avoid the stepfather's furies, though often besotted, demeaned and mistreated in what seems to be his miserable lot in life. For all his drinking, disrespect and despair, he becomes the only character on stage that one cares about, even if only a little. At least the problem son is at an age where troubles are common, and stands a chance of redemption through maturity. But it is too late for the husband and wife, they are adults who clearly have never had any desire to grow and mature. The mother and father have devolved into nothing more than the instruments of their own desires, and the sort of superficial people that often pass for human beings these days. Playwright Christine Whitley is merciless in her portrayal of people whose lives are reduced to a series of selfish negotiations, devoid of any real love or caring. Randy is in perpetual lust with his wife. Charlotte offers and withholds her favors to get what she wants. The couple's wedding vows were clearly a formality. Charlotte is an uneducated and hopeless failure of a human being with only her looks and guile to prevent her from ending up in Title 7 housing. She has a small bag of tricks, various masks she uses to great effect depending on who she is trying to con. While her behavior is corrupt and the need for survival a possible rationalizaton, it is the neglect of her own son that damns her, and reveals the ultimate squalor of her soul. Completing this picture is the lawyer John who tries to help Charlotte sort out her major current problem - the missing funds from her part time job. It is an exercise in futility as Charlotte lies and deceives even those trying to help her. This climaxes in a confrontational scene set up by her son, in which her husband arrives home unexpectedly to size up the lawyer. In this family, guns are acceptable negotiating tools, and the resultant intimidation causes the lawyer to quit the case and flee. With the legal help gone, the husband regains control. The balance shifts. "And as the stomach turns, the problems multiply. Tune in again tomorrow and see how much more misery they both can endure..."
Sparks fly throughout this play, tension mounts, and soon the story has us in its spell. It may turn out that we have another David Mamet here, a writer who has an ear for dialog and situations that appear to be commonplace, yet can raise them to the level of compelling theater. If Whitman had meant us to care one whit about these characters, she would have built something into the script that would help enable us to relate to them as human beings. She didn't, and as such she may have put her finger on the increasing desolation and aloneness many feel in this new century, one in which we find a nation almost at war with itself, full of finger pointing and self interest instead of unity and strength. Is this a neo-morality play, a new direction for American drama which always seems to forecast such sociological changes? If so, heaven help us. The direction by Robert Walsh keeps everything moving and in focus. Just how much the of the first act's opening, with Charlotte's passive aggressive door-slamming, pot-rattling, plate-smashing was in the script, and how much was the acting, or directing, is not important. Those first few minutes of the play did more to establish the seething, boiling relationship between husband, wife and son than words could ever convey. Pictures may be worth a thousand words, but actions can replace millions. Despite limited playing room, the set had many nooks and crannies that opened up the stage into multiple settings. The evening sped by, thanks to constantly changing scenes and settings, moving quickly from situation to situation. This was largely accomplished through very sophisticated lighting design. The many expensive lighting instruments I noticed on arrival were all put to good use. Designer Matthew Miller deserves to take a bow, too. But Shakespeare & Company's barebones approach to scenery has its drawbacks. While the stationery set was brilliant, how I wish someone had the common sense to mask that slatboard wall of the new facility with a black drape or flat finish so it was less distracting, even invisible. I have noted this low cost banded wall trend in several new buildings, but I sincerely hope this fad will soon pass and we get back to unobtrusive smooth black (or beige or white) boxes for experimental theaters. This staggered wall pattern also breaks up the sound, creating acoustical problems for those seated on the sides of the theatre. When actors are not facing them, too much of their sound is broken up and absorbed by this finish making them difficult to hear. The drop off in sound in these instances is very annoying. All in all, this is a totally absorbing evening of theatrical storytelling, by a promising new playwright and a great cast. Goatwoman of Corvis County has quite a tale to tell. You'll be very grateful that this family does not live next door to you.